Gastric bypass is a procedure where a piece of small intestine is used to connect the top part of the stomach to the jejunum of the small intestine, effectively bypassing the stomach and the first part (duodenum) of the small intestine and rerouting the intestines. This procedure is also known as the Roux-en-Y since the intestines form a y-shape after the procedure. The procedure is used to assist with weight loss in patients who have a body mass index (BMI) of over 40 and who are considered to be morbidly obese; and for patients with a body mass index between 35 and 40 who also have a condition related to being overweight, such as high blood pressure or type 2 diabetes. Food bypasses the posterior part of the stomach and the duodenum and enters directly into the jejunum. Gastric juices from the stomach enter the duodenum which is then rejoined to the jejunum. This means many nutrients from food are not absorbed. The stomach is also made very small so that only about 1 ounce of food can be contained, thus people have to eat less. There are risks associated with the surgery, including heavy bleeding, infection, leaking from the digestive system, and a small possibility of death. There can be later complications from gastric bypass including bowel obstruction, dumping syndrome, gallstones, stomach perforation or ulcers. There is more weight loss with the gastric bypass compared with gastric sleeve. Gastric bypass also leads to greater resolution of comorbidities than is the case with the gastric sleeve procedure. In other words, patients may no longer have such illnesses as type 2 diabetes or GERD after gastric bypass. These two conditions, in particular, are often better resolved with bypass than sleeve surgery. Since part of the small intestine, the duodenum is bypassed in this procedure, it means that fewer nutrients are absorbed and patients may suffer from lack of vitamins, which may necessitate taking supplements to overcome this problem. There are potentially more side effects and the procedure is more expensive than the gastric sleeve. Gastric sleeve is a procedure in which most of the stomach (85%) is removed leaving a sleeve of the stomach in place, but intestines are left unaffected and not rerouted. The procedure is used to assist with weight loss in patients who are morbidly obese, that is patients who have a BMI value that is 40 or higher, or who have a BMI of 30 up to 39.9 as well as comorbid conditions such as sleep apnea, type 2 diabetes or hypertension. 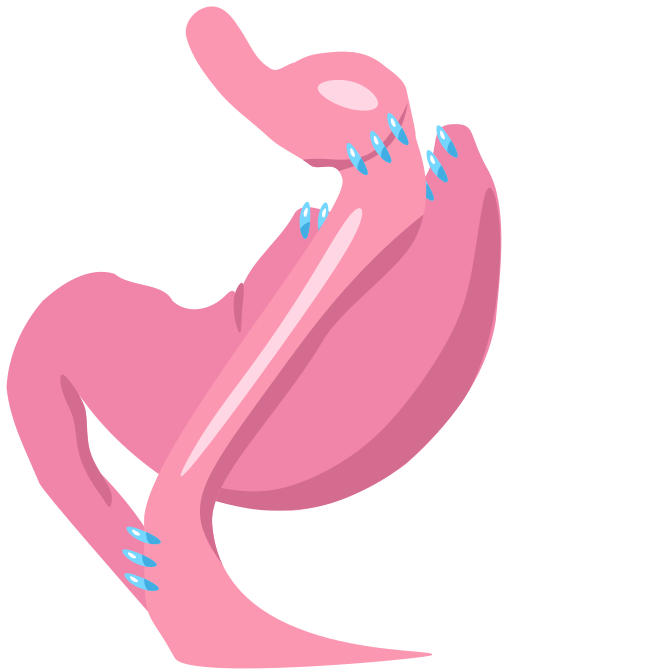 The stomach is stapled and made smaller in size so that less food can be contained in the stomach, meaning a person eats less. The food can still enter the duodenum as usual and nutrients can be absorbed. There are risks associated with the surgery including bleeding, leaking from the digestive system, and possible problems with digestion. Since the small intestine is unaffected by this procedure, it means that nutrients are still well absorbed since food still passes through the duodenum, and patients may not need to have to take supplements. There tend to be fewer side effects compared with the gastric bypass, and the procedure is less expensive than the gastric bypass. This surgery is slightly quicker than gastric bypass and patients may spend less time in the hospital recovering. There may be less weight loss with the gastric sleeve compared with gastric bypass, or it may take longer for weight loss to occur. The gastric sleeve does not always lead to as a good a resolution of comorbidities as occurs with the gastric bypass procedure. For instance, GERD and diabetes type 2 only resolve in about 50% of patients. Gastric bypass is a procedure where part of the stomach and intestines are bypassed, while the gastric sleeve is where part of the stomach is removed, but intestines are not affected. The small intestine is surgically rearranged in gastric bypass to form a y-shape so food bypasses the duodenum. The small intestine is not affected in the gastric sleeve. Nutrient absorption is impacted by gastric bypass but this is not the case in the gastric sleeve. 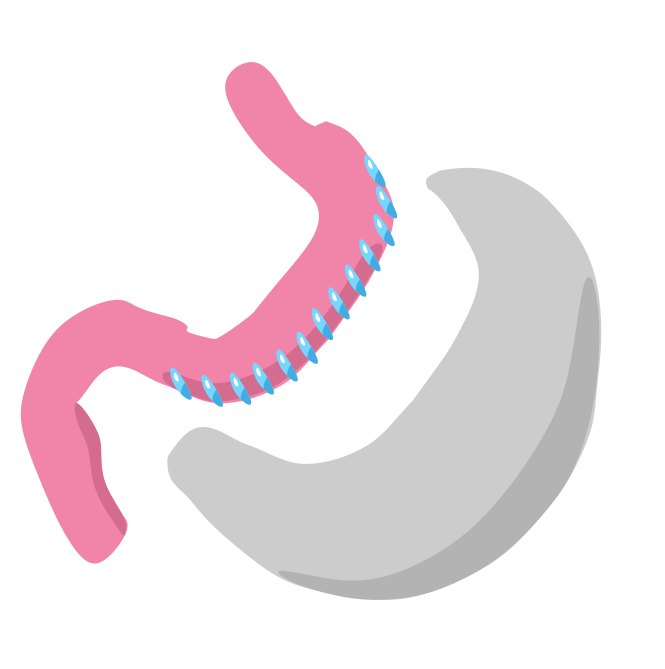 In gastric bypass, the stomach can hold less food so the person has to eat less, and there is malabsorption of nutrients, while in the gastric sleeve the stomach can hold less food so the person has to eat less. Severe risks and later complications can occur with gastric bypass, less severe risks, and complications can occur with gastric sleeve. Gastric bypass is a more expensive surgery (just over $24,000 on average) than gastric sleeve (just over $17,000 on average). Both gastric bypass and gastric sleeve are procedures that are used for very obese patients, to help weight loss. Gastric bypass involves rerouting of the intestines and making the stomach smaller so that patients are less hungry and fewer nutrients are absorbed. Gastric sleeve involves simply making the stomach smaller so that patients are less hungry. Both procedures work but gastric bypass is more expensive and may lead to too many nutrients being lost. Gastric sleeve is less expensive but it may take longer to lose the weight. Dr. Rae Osborn. 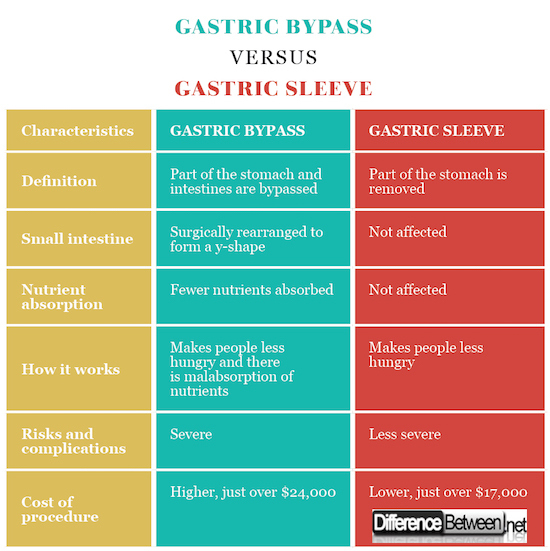 "Difference Between Gastric Bypass and Gastric Sleeve." DifferenceBetween.net. May 15, 2018 < http://www.differencebetween.net/science/health/difference-between-gastric-bypass-and-gastric-sleeve/ >.